Exciting times here, as The Women’s Football Encyclopedia is expected to hit the presses within the week! But this is the moment you’ve been waiting for…a glimpse inside the book itself! Let me give you a little tour of the book and what’s inside. As the name suggests, The Women’s Football Encyclopedia is designed to be an encyclopedic overview of the history of women’s football. At over 400 pages, this book is jam-packed with fun facts about the history of this great sport. I dare say, without exaggeration, that every single person who reads The Women’s Football Encyclopedia will come away having learned a lot about the history and evolution of women’s football, and it is designed to be a reference book that women’s football historians will consult again and again. 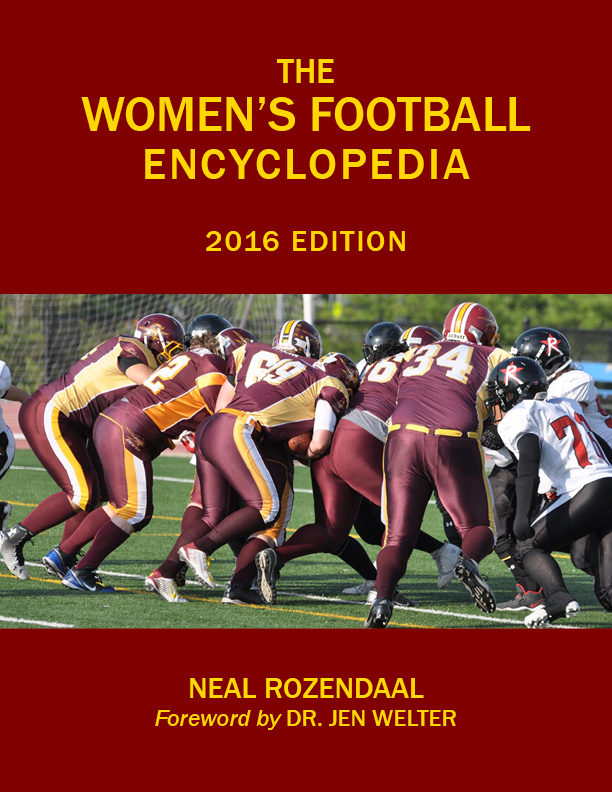 Okay, so The Women’s Football Encyclopedia starts with your usual front matter…an introduction, table of contents, and of course, the foreword by Dr. Jen Welter. The book then features six chapters. Here’s a look at each of them in turn. Chapter 1 deals with the 20th century history of women’s football. It includes an essay outlining the evolution of the sport throughout the 20th century, a list of confirmed women’s football teams from the “first era” of women’s football from 1967-1985, and a list of confirmed women’s football games from the same time frame. If you’re a fan of the Oklahoma City Dolls or the Toledo Troopers, this is your chapter! Chapter 2 is a big one…21st century leagues. The chapter begins with an essay that outlines the history of women’s football throughout the 21st century. Then it’s time for one of the two big sections of the book…the league section. In the league section of the book, I break down each league, year by year…complete with standings and a game scoreboard. Every league in women’s football, current and former, is covered in this book. The WFA, IWFL, and WSFL are here, of course, but so too are many leagues you may have forgotten. Remember the HWFL? Or the AFWL? How about the WAFC or the WAFL-WFA? Those leagues – and more – are all broken down in The Women’s Football Encyclopedia. In the standings, I list every team by division in order of division finish, their final win/loss record, and a code listing their playoff finish (don’t worry…there’s a legend included in the chapter!) Also, and I think this is very cool, I list where and under what name the team played the season before and the season after. This will help readers get a sense of the annual shuffle of teams from league to league, an offseason ritual in women’s football. On the league scoreboard, I list every game I have found, complete with the date, the team codes, and the scores. I also give some games a game code (if applicable) to denote exhibition games, interleague games, and postseason games, among other things. Here is an excerpt of Chapter 2, recapping the 2013 WFA season (which, for my money, was the single greatest season by any league in women’s football history so far). You can take a look at this season, from the opening game to the national title contest, won by the Chicago Force. On to Chapter 3, which focuses on 21st century franchises and players. This contains the second big section of the book, the franchise section. Nearly 300 women’s football franchises are listed in this section, with their year-by-year records, division finishes, and postseason results noted. This is followed by the game-by-game section for each franchise, listing the date, location, opponent, and final score of every game I have available for them. Finally, game codes are again used in this section to denote exhibition games, interleague games, postseason games, and more. For many teams, the game-by-game section is followed by an all-time player register…and ladies, this is your time to shine! Where publicly available, rosters for women’s football teams have been combined to create all-time player registers for many franchises. Players are listed alphabetically by last name, followed by the years in which they were listed on that team’s roster. All told, over 10,000 women make up the player registers of The Women’s Football Encyclopedia, marking them forever as pioneers of this great sport. Here is an excerpt from Chapter 3, and staying on the Windy City theme, here is the Chicago Force’s entry in this section. Chapter 4 lists all the national and league champions of this sport over the years, and it also includes a limited record book filled with sportwide team records. Ever wonder what team has won the most conference championships? Or which team has scored the most points in their franchise history? Or which three teams are tied for the women’s football record by each having pitched 55 shutouts in their franchise histories? Of course you have. Well, wonder no more, because it’s all in Chapter 4. Chapter 5 is the lingerie football chapter. I know, I know…I debated for some time about whether to include a chapter on lingerie football in the book, since lingerie football is an abhorrent perversion of the true sport of women’s football. However, many fans are not familiar with any kind of women’s football other than the lingerie variety, so it needs to be represented. After a couple of introductory essays, lingerie leagues are profiled in Chapter 5 in the same format as Chapter 2. Chapter 6 is the last chapter, and it’s an exciting one, as it addresses international leagues. I review the overall growth of the game internationally before giving a few international leagues the Chapter 2 treatment. This year-by-year section focuses principally on three English-speaking nations and territories – Canada, Australia, and Guam. Someone asked specifically about whether the Saskatoon Valkyries would make an appearance in the book, and yes, yes they do! Take a look at the excerpt from Chapter 6, which profiles the two most recent seasons of the WWCFL. Finally, we round out the book in appropriate fashion. After listing a few international exhibition games, we give the final word and final section of the encyclopedia to the IFAF Women’s World Championships. That’s your sneak peak at The Women’s Football Encyclopedia! If you’re involved in women’s football in any way, I think you’re going to love this book. It is the most complete and comprehensive history of women’s football ever written, and I sincerely hope it becomes the catalyst for future research into the sport. The book may have a few holes, but maybe with your help, we can plug those holes and together uncover even more of the history of this great sport! Thanks to all who have already purchased the book on this site! The first run of books will be hand-numbered, marking them as one of the very first copies off the press. Want your own first-run copy of The Women’s Football Encyclopedia? Reserve yours today!